Ships tomorrow if you order in the next 22 hours 38 minutes. 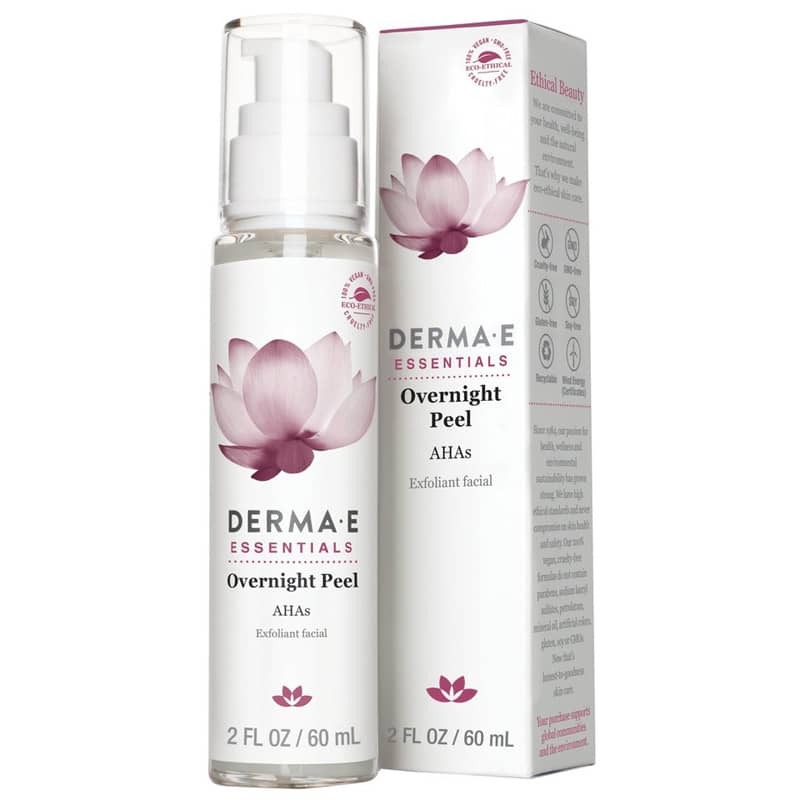 Derma e Overnight Peel with Alpha Hydroxy Acids is a fragrance-free natural skincare complex that gently exfoliates to help diminish the appearance of fine lines and wrinkles. 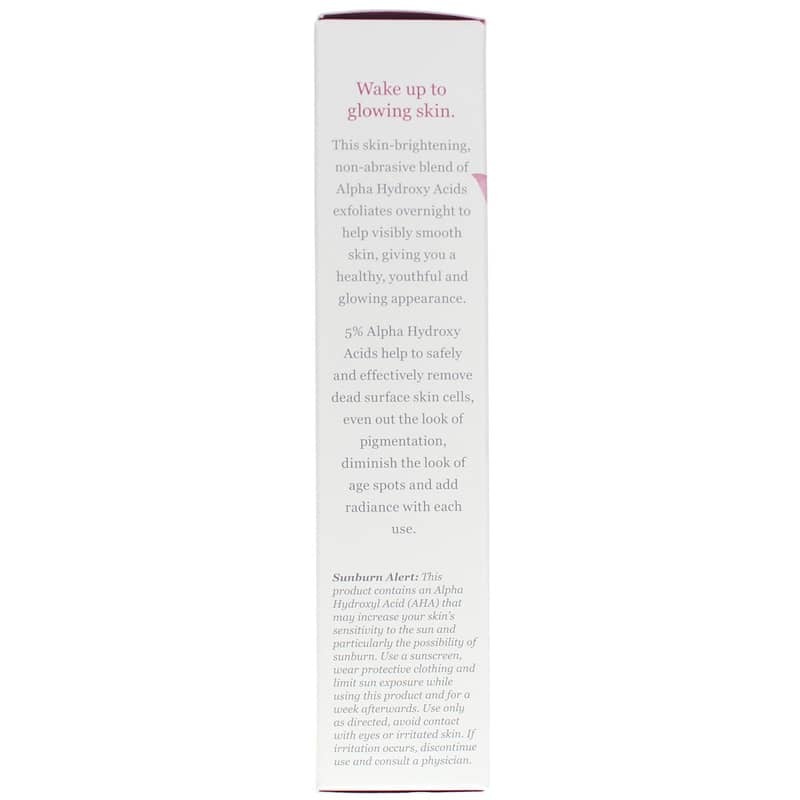 This intensive skin-brightening complex blends alpha hydroxyl acids and other fruit acids to revitalize and rejuvenate skin to leave it softer and younger looking. 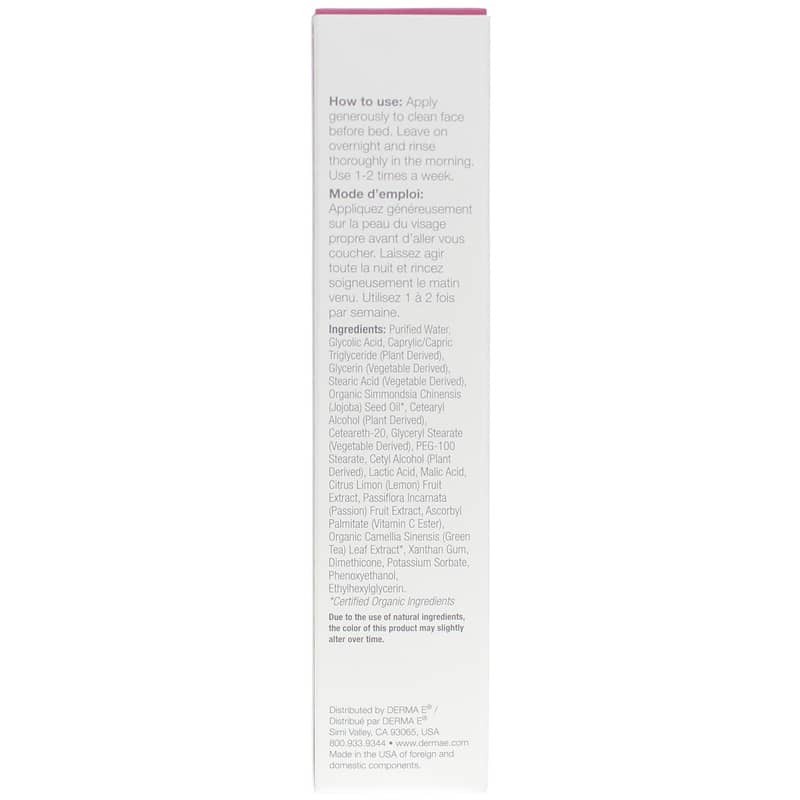 At the end of a four-week trial of the Derma Es skin-brightening line, over 82% of those who took part said they noticed an improvement in overall color and tone of skin. Derma e is a family-owned business. 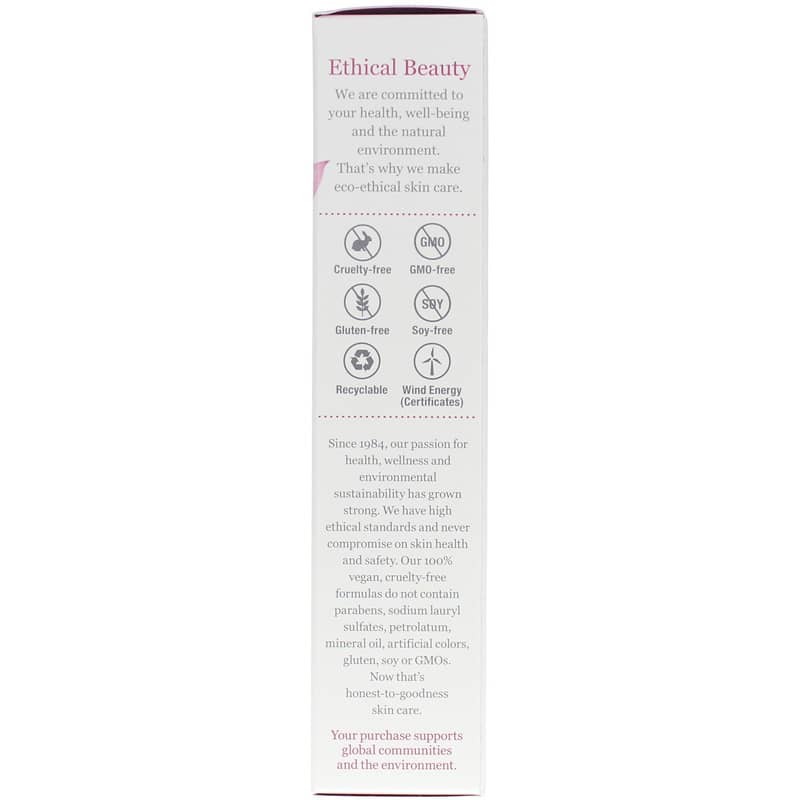 And its products are never tested on animals and are free of harmful parabens, phthalates, sulfates, petroleum, mineral oil and artificial colors. And the company donates part of every sale to the Paraguay Project, which helps families in this South American country earn a sustainable income. Purified Water (Aqua), Glycolic Acid, Caprylic/Capric Triglyceride (Plant Derived), Glycerin (Vegetable Derived), Stearic Acid (Vegetable Derived), Organic Simmondsia Chinensis (Jojoba) Seed Oil*, Cetearyl Alcohol (Plant Derived), Ceteareth 20, Glyceryl Stearate (Vegetable Derived), Peg-100 Stearate, Cetyl Alcohol (Plant Derived), Lactic Acid, Malic Acid, Citrus Limon (Lemon) Fruit Extract, Passiflora Incarnata (Passion) Fruit Extract, Ascorbyl Palmitate (Vitamin C-Ester), Organic Camellia Sinensis (Green Tea) Leaf Extract*, Xanthan Gum, Dimethicone, Potassium Sorbate, Phenoxyethanol, Ethylhexylglycerin. Contains NO: gluten, GMOs, soy. Apply generously to clean face before bed. Leave on overnight and rinse thoroughly in the morning. Use 1 to 2 times a week. Avoid eye area. Sensitive skin may experience mild transient tingling. If skin irritation occurs, discontinue use.